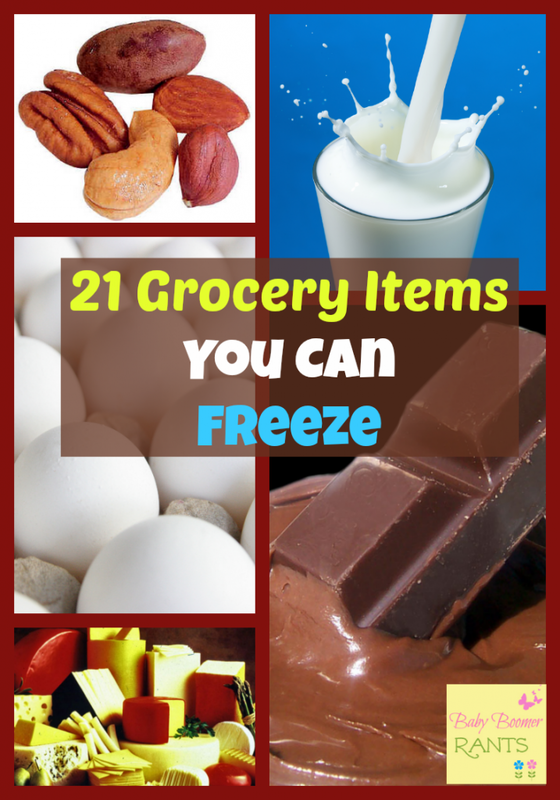 21 Grocery Items You Can Freeze! You are here: Home / Family Living / Household Hacks / 21 Grocery Items You Can Freeze! When we had 4 kids at home I often wanted to buy extra when there was a good sale, but, I was always afraid it would spoil before we would use it. So, I learned a lot about what I could freeze. We have/had 2 refrigerators and 2 deep freezers at all times. I always kept the deep freeze and 1 fridge outside and then 1 fridge inside in the kitchen. We recently moved and I now have 2 fridges in the kitchen and 1 deep freeze in the laundry room, and even with just the youngest left at home we still stay pretty stocked up on everything. Cakes – I used to do some decorating and I will tell you there is nothing more moist than a cake iced while still frozen (which is easier by the way) and then allowed to thaw under the icing! Try it! Lunchmeat – A lot of times I find a canned ham that is cheaper, once sliced, than lunchmeat. I usually find a canned ham around 5 lbs and take it to the deli or butcher and ask them to slice it for me (they will do it FREE of charge) and then I take it home and re-package it in smaller packages and freeze the individual packages. Read about 10 more FREE Little Known Grocery Store Services! I usually keep my open Chips in the fridge to help keep them crisp longer – but, I have heard that you can freeze them with great success! Hope this helps! I use a Foodsaver to make it airtight. You can also wrap it in wax paper and then foil and then put in an airtight container. The key is making it moisture free by using an airtight method. I heard you can freeze peanut butter ??? Is this true ???? You can freeze Peanut Butter! That’s a great one! So, it’s much safer to keep it in the fridge or freezer. And actually out of the freezer flour has an estimated shelf life of 3-6 months. It can actually go bad. Though, I have never seen it, in certain areas such as very humid areas, it can go bad.